You've seen the older video on the South Florida food forest project I've been working on for the last couple of years. 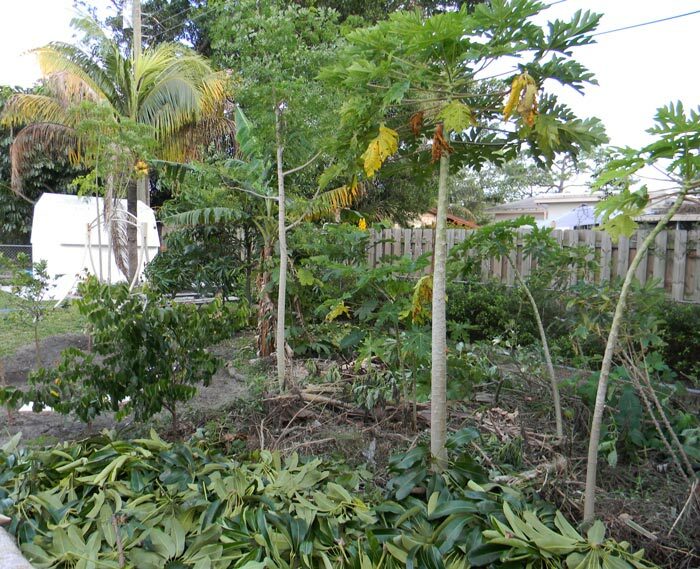 Though I make it sound like it's this incredible, unattainably awesome Work Of Science, it started as a few tropical plants in the back yard of my parents' home in Ft. Lauderdale. ...until I got obsessed with the food forest concept a few years ago (and also started helping Mom with her garden). I asked if I could perhaps start a tropical island of plants. Dad, being a forward thinker, basically told me I could take what I wanted of the yard, provided I told him what could be mowed, and what couldn't. Years ago, I planted a coconut back there which is now a lovely palm - and Mom had already planted a Mango and a Navel orange tree about 3 years ago (the latter succumbed to the greening virus at a tender age)... so I decided to add a few more trees and some cassava to the mix. 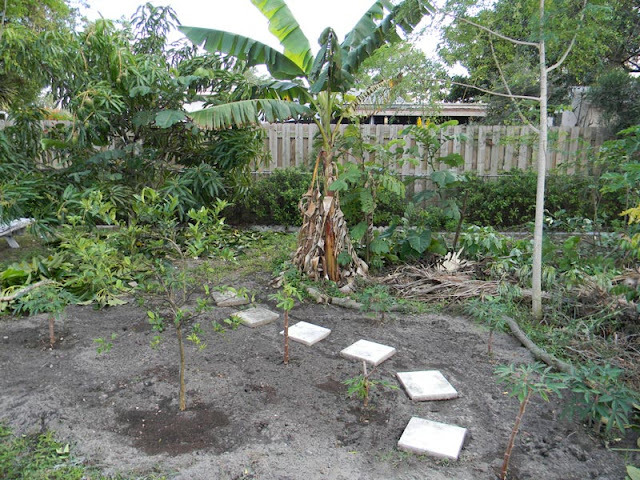 Over successive visits, I added a starfruit, a fig (now deceased), some bananas, a couple moringa seedlings, a lemon, a giant Thai variety of avocado, and a Key limequat. Then I put in a few support species like Tithonia diversifolia, coral beans, black bamboo, malanga, Senna alata and other bits and pieces. Dad and I piled compost, yard waste, tree limbs, leaves and whatever organic matter we could find around the plants, putting it on top of cardboard to smother the weeds and grass and give the edibles a good head start. When I visited a few weeks ago, most of the first round of plants were looking great. 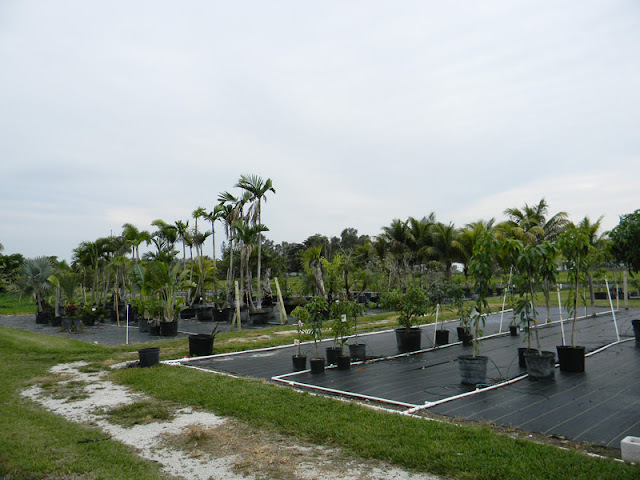 Dad was game to add some more, so we hit Spyke's Grove Nursery in Davie... a classic place to find exotic plants in Southeast FL. Where was I? 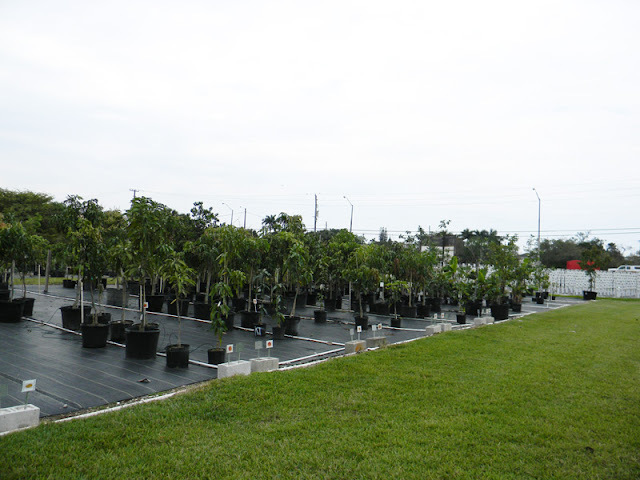 Ah yes - hunting for tropical fruit trees with Dad. We went to Spyke's and I had a few things in mind. 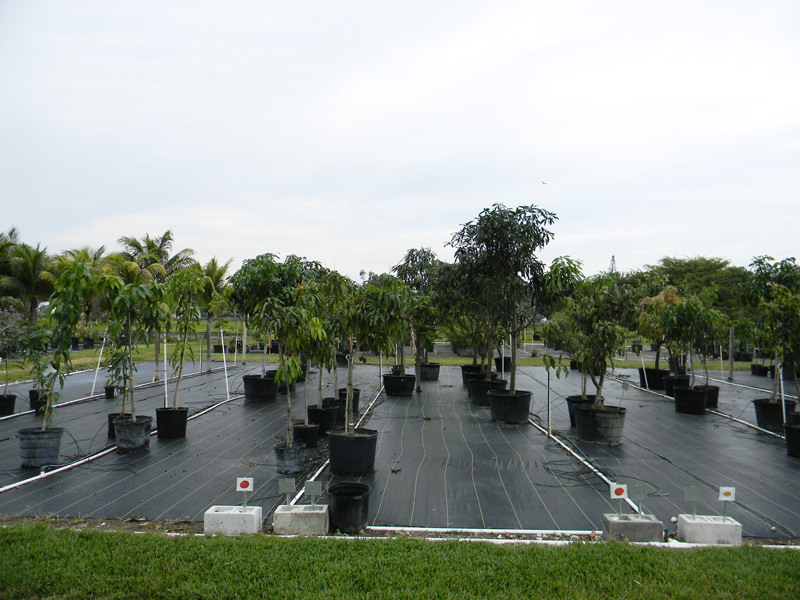 I've been obsessed with Jaboticaba trees for over a year, so we hunted down two of those (one for Dad's yard, and the other for my greenhouse). 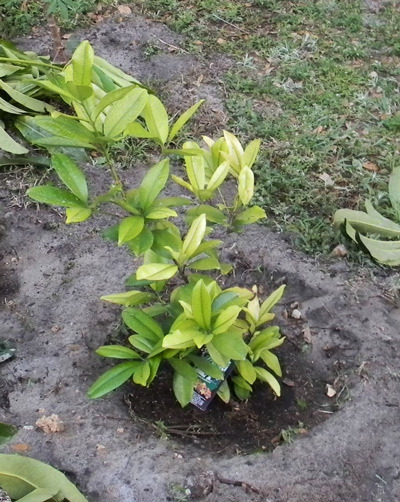 We also nabbed a grumichama tree, an acerola cherry, a cinnamon tree and a strawberry tree (that one's for my yard). On this trip, I had also brought down with me a "6th Street" Mulberry and a cattley guava from the Edible Plant Project in Gainesville, along with another cassava variety to try out. Next post... I tell you what we did with them and share a few more pictures.